Most people talk about eating three squares a day — unless you’re a Brit, in which case there’s also tea, or a hobbit (second breakfast, elevensies) or a stoner (Taco Bell’s Fourth Meal). For the Jews, that somewhere-in-between meal is called kiddush. Following Shabbat services, Jews gather, ritually sanctify wine – the root of the word kiddush – and have a bite to eat. In some congregations, that bite might be a crunchy cookie called kichel and a piece of gefilte fish or herring on a toothpick, all washed down with a shot of schnaps. Or, it could be a sit-down luncheon where the group breaks bread together (its own extremely important ritual), and then eats kugel, salads and maybe some bagels. 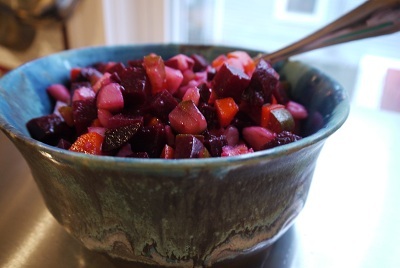 Syl’s kiddush report reminded me of the kiddush of my childhood. It’s strange now that I think about it, because, due to merger and attrition, neither my mom and stepdad’s congregation nor my father’s exist anymore. But on Saturday morning, if I wasn’t in services, I’d be helping prep platters of cookies and visiting with the kitchen crew, many of whom, like the congregations themselves, have also passed on. I recreated Ruthie’s Broccoli Salad for dinner tonight. Rich was at a meeting, and I had the perfect amount of broccoli in the fridge for one serving. 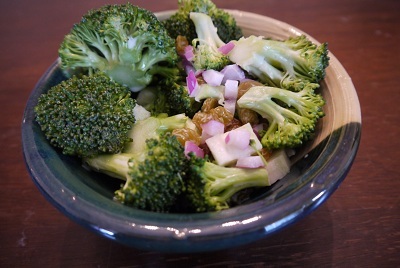 My stomach is not a fan of raw broccoli, so I steamed mine, but only for a minute or two. This salad calls for a crunch. The recipe here serves one, but obviously, it can be doubled, tripled, quadrupled — enough for a whole congregation. 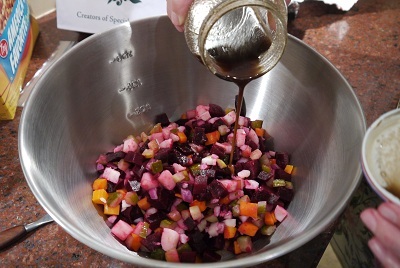 Whisk together the dressing ingredients. Pour over broccoli, onions and raisins. Refrigerate for several hours.